P.J. Parrish (website) is a pseudonym that two sisters Kelly Nichols and Kristy Montee use as an alias for their books. 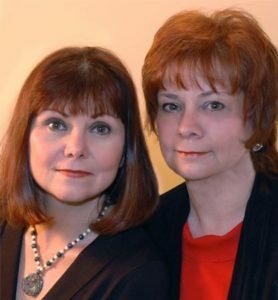 The author duo is most popular for their Louis Kincaid crime mystery series, featuring the biracial Michican-based police detective, who eventually becomes a private detective. Some of the books in the Louis Kincaid series have won various awards, including an International Thriller Writers Award, a Shamus Award from the Private Eye Writers of America, and an Anthony Award. Here are the P.J. Parrish books in order for their popular series, and their standalone novels (which I have just read and reviewed on this site). Kelly Nichols loved writing from a very young age. At the age of 10 she wrote a few pages crime thriller with her only critic being her father. When she was in junior high, she was writing crime stories in her spiral journals. She graduated from the Northern Michigan University, after which she moved to Arizona, followed by Last Vegas where she worked as a blackjack dealer and later a human resource manager at a casino. She spent 20 years doing everything but writing, however the itch to put words on paper remained. She started writing the first Louis Kincaid on her own, however soon she teamed up with her sister and finished the book together. She lives in Houghton Lake, Michigan where she is collaborating with her sister on new books. Kristy Montee had also a knack for writing from her early childhood. Her first short story under the title The Cat Who Understood, was written whens he was in the 8th grade. She attended the Eastern Michigan University where she got a teaching degree, following which she worked as a journalist in Michigan and then in Fort Lauderdale, working as a assistant managing editor at the Sun Sentinel, where she ended up writing all sorts of things and jumping from a police reporter to a ballet critic, and everything else in between. After a few career hickups, she decided to follow her dream of becoming an author, so she left the newspaper industry and started writing books. Her first 4 novels were in the romance genre, which she soon found boring. She really found true self in the mystery genre, when she start working together with her sister on their first series.